My new work laptop is a ThinkPad W510... a Core i7 Q 720 at 1.6GHz. 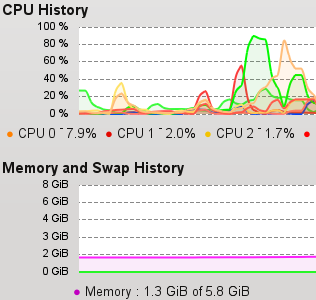 It has four hyperthreaded cores which /proc/cpuinfo allows me to monitor as eight... meaning my system monitor looks awesome. Now I'm at the bleeding edge (I guess) of hardware, as now everything requires the latest drivers. I had to manually acquire the firmware for my wireless NIC from Intel directly, then build the Linux wireless drivers from source and install them. Luckily the process was surprisingly easy... it was just that I had to track down and download kernel sources, the GCC build chain, firmware and the wireless driver package without Internet access on the laptop. Still, once that was done the Linux wireless source configure/build/install was quick and easy. I also had to go directly to NVIDIA's beta driver portal and get the very latest binary drivers for the GPU as well... the console itself was being corrupted by display errors. Again, not hard to fix, just another step. In the age of everything "just working" on Linux distros I was glad to see that the ancient art of configure/make/make install is still being practiced... in fact it works better than ever. I've long been a fan of NetBeans, but for the past several years I have had to use Eclipse. Nearly all of the projects or organizations I've walked into have had pre-existing standards and ways of doin' stuff, and the worst thing you can do as a greenhorn in a company is try to switch horses mid-stream. Wow... I get a triple combo score for clichés there. Now I get to bootstrap a development team and decide what we use. The awesome thing is that there are now something like elebenty kabillion IDEs, RIA frameworks and rapid application environments. JSF no longer blows. Everyone uses the same build files now. XML hell is now in the rear-view mirror. Vendor lock-in isn't what it used to be thankfully enough. When I started building out projects I went for an IDE with tight Maven 2 integration, JSF 2.0 support, Java EE 6 interwoven and nice Subversion tools. I imagined that I'd be heavily leveraging plugins from the Spring IDE project and plugins from JBoss, notably the Drools Workbench. All this plugin support caused me to initially lean towards Eclipse. As I went further along I also started using GlassFish v3 instead of Tomcat, exploring JavaFX and increasingly using Maven 2 for continuous integration and artifact generation. I didn't really use the features of Spring IDE at all, and while I did use the Drools Workbench I ended up doing more decision-table type stuff, making drl's easier to manage. Ultimately a deciding moment came when I needed to do a very quick-and-dirty desktop application with a simple user interface... something that just needed a logo, URL text field, username and password. For the life of me I couldn't find any free/OSS plugins for Eclipse that let me create a quick JDesktop or Swing application... at least within the 45 minutes that I had available. After pulling out my hair I had a sudden flashback to the good ole' ConsultComm days and reminisced "boy, creating UIs in NetBeans sure was swell." It was at that point when I tried to think of any reasons why I was sticking with Eclilpse... and came up empty. I've switched to NetBeans, which the IDE itself made extremely easy with it's Eclipse workspace synchronization. Read that line again... synchronization. I know! Mind blowing! It doesn't import the project, it allows your project to remain in the Eclipse workspace while also being mantained in NetBeans. Easy! All the UI goodness I remembered was still there. In no time flat I had created the entire UI and help menus. Not once did I consult a HowTo or documentation, instead it all immediately made sense. The entire project was done before lunch. I have shifted all of my development to NetBeans now, despite the fact that I can't be sure where its future lies. I don't care. I'll take advantage of an easy-to-use IDE as long as I possibly can. If I switch back to Eclipse in the future it will like be because I was forced to... just like every other time in the past. As for standardizing on a development environment: I've learned that no one IDE fits all. Every developer has a preference, and with Maven 2 reaching near-ubiquity it doesn't matter nearly as much as it used to. I say let every developer chose his or her IDE, just pick the one you work most rapidly and naturally within. As long as I can build it with mvn on the command line I just don't care.